I watched it yesterday and enjoyed it despite long-winded, unedited moments of dialogue. Fortunately it is good dialogue with an Emmy-ready cast worthy of delivering those witty lines that often relate to relevant stories of the past, like the BP oil spill of 2010. Jeff Daniels is great as the managing editor and unlikable anchor but it is Emily Mortimer who takes the cake, playing off Daniels like a gust of wind through the Puget Sound. 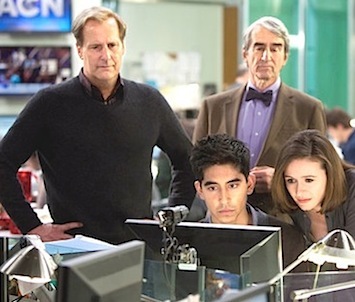 Between supporting roles played by Sam Waterston, Dev Patel, Olivia Munn, Alison Pill, Jane Fonda and Adina Porter and Sorkin’s experience creating and writing shows that explore the behind-the-scenes world of fictitious TV programs (Sports Night, Studio 60 on the Sunset Strip), we’re in good hands. Next Next post: Octomom Has A ‘Boyfriend,’ What’s His Motive?